As promised from last week, I'm here today sharing some pictures of our outdoor areas. Lately, as the leaves have been covering the trees, the grass is growing at an unbelievable rate, and the weather has been gorgeous, I've been spending a ton more time outside. We are extremely blessed to have such an expansive outdoor area. We have five acres on our property total, and own the attached property as well- so there is a ton of outdoor space. Although having all this outdoor space does definitely have its perks, it's also a hassle when it comes to taking care of it. Before we start with the scenery...how cute is this little one hiding under the stairs??? With all the mulch we put in the garden beds, everything is looking brighter and healthier! The upper- area of our backyard is looking super green too. All the leaves came in, and now there's a little privacy between the backyard and the driveway! 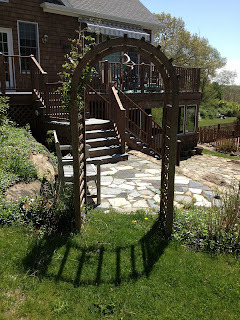 Love this trellis- It looks so pretty in the yard. What have you done with your outdoor areas?